Here are top selected products for "Men's Watches"
Gone are the days when mens watches were mere timekeeping accessories. Today a watch makes a fashion statement, it is a status symbol, and above all, it is an accessory for all occasions. Some may ask, why have a watch when you can tell time by cell phone, television screen or a laptop? Well, a quick glance at your wrist is classier than to dig out your mobile phone every time you want to check the time. Watches add that understated elegance to all occasions. Whether it is for work or play Snapdeal has a vast array of mens watches for you to choose from and, if you want to match your selection with the watch for the lady in your life, Snapdeal offers branded watches for women too. Finding the right watch includes looking into the size, shape, color and the occasion you want to wear it for. Purchasing a fine timepiece is going to be a significant purchase so it is worth to spend some time on research and then select what you like. Here are some tips to help you find that perfect mens watch that will complement your personality, your lifestyle, and add to your style statement. When considering the colour of the watch two areas to look at are – the watch dial and the band. A watch face gives its own distinctive personality so make sure it matches yours. A white face watch goes well with almost every outfit while a black watch face is versatile and mostly looks attractive with a black band. When it comes to bands, the most common colours are black, navy, silver or gold. Choose the colour of the quartz watch that suits your style. For instance, gold is more traditional and silver is contemporary and matches with more outfits than gold does. Gold will be perfect for a wedding and a silver band will add class and charisma to your business dinner. A watch looks big or small depending on the size of your wrist. 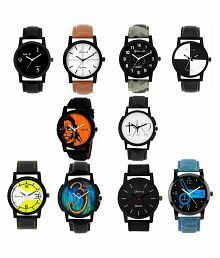 The watch with 40 mm case diameter may look bulky on a smaller wrist but the same watch would look perfect on the wrist of a strongly built man, there are also a wide range of Kids watches one can choose from to gift their children or loved one on occasions such as birthdays. Branded watches for men generally have a case diameter ranging from 34mm - 46mm. Sporting a disproportionate watch – a watch that is not proportionate to your wrist and hand will ruin your style. If you are lean with a smaller wrist, go for the size at the lower end of the case diameter range, and rugged gents with larger wrists should go for a case diameter 42mm and above. The other features that make the watch look smaller or bigger are the case thickness, and the band’s width and material. Most of the time the case thickness is proportionate to the diameter so choosing the right case diameter will solve this problem. A leather band gives a slimmer look to a watch, while a metal band will make the same watch look heavier. The wristwatch for men has two types of display – analogue and digital. 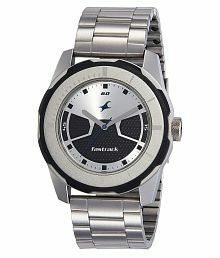 Brands such as fastrack offer both analogue and digital display watches. There is no rule that one should own only one type of watch. You can own both analogue and digital watches to make the best use of both the features and style they offer. An analogue watch face has hands to indicate hours, minutes and sometimes seconds, whereas a digital watch face uses only numbers to display time and date. Analogue displays look classy and reflect simplicity and elegance; therefore, watches with such display go well with business suits or with a traditional kurta. Analogue watches are also easy to set. Digital displays are for convenience and practicality, these also come in gift sets, a good watch is always a good gift to give someone. when you have to use a stopwatch during your workout or when you want to plan your presentation to the exact minute, a digital watch is ideal for such situations. At work, digital watches act as calculators, chronometers and alarms. Digital watches are a good choice for work or adventurous outdoor activities. When comparing both displays, consider factors like their readability, how to set them and their style. Digital watches are preferred over analogue for readability while analogue watches are preferred over digital for setting. However, they both have a good range of styles to choose from. Buying analogue or digital men’s watches online is easy because you can compare the features, style and price all at one place. Watches are generally worn for long hours, and a very heavy watch might not be comfortable and on the other hand, lighter watches shouldn’t look like a child’s watch. Having said that, there are a variety of lightweight men’s watches that are contemporary in design and tell you the time in the most simplistic way. It is important to note that the weight of the watch is the combined weight of the case, the band, and the buckle that fastens the band. 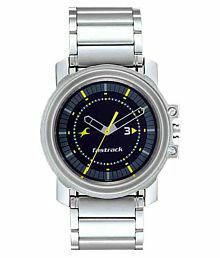 Watches are manufactured in steel or titanium cases. In case the buckle or strap breaks you can always get the best watch accessories online. A watch in steel can be heavy to handle because it is heavier than titanium; steel has a classic look and it can be plated gold if you desire. Consider the duration you will be wearing your watch in a day if the weight bothers you then you might want to go for a lightweight style made of titanium, which is lighter and stronger than steel. Titanium watches are corrosion and rust free but they can crack under pressure. However, they are considered the best watches for men. Today, watches do more than just tell time. They come with a range of features to suit your needs, lifestyle and provide convenience to your daily activities. Manufacturers have put in a lot of efforts to design watches that suit an individual’s personality taking into consideration the multiple roles men play in their day-to-day life. Generally, you will find more features in a digital watch. If you look for more features on an analogue watch it will get bulkier. For instance, a sports watch can be used as a stopwatch and they are resistant to damage from water or shock. If you are a businessman dealing with clients internationally, a watch that displays time in several time zones will be best for you, choose a watch from a brand like Fossil for durability and catchy design. There are sports watches for men designed to accompany the adventurous ones in their outdoor activities, these watches are equipped with a compass, GPS, altimeter or display moon’s phase. Also, there are watches embellished and designed for special occasions like weddings, anniversaries and birthdays. Choosing the desired features first; for your wristwatch, will narrow down your options and help you find the perfect timepiece. What is the Movement the Watch Uses? The movement of the watch refers to the sweep of a watch’s hand around the face and the internal mechanisms involved in producing that effect. There are three types of watch movements – mechanical, automatic, and quartz. The mechanical movements are a result of breath-taking craftsmanship gears and springs work together inside these mechanical watches to give you the time. Mechanical watches require winding depending on the length of the mainspring. If you appreciate the craftsmanship and fine engineering, then you should have one mechanical watch in your collection. 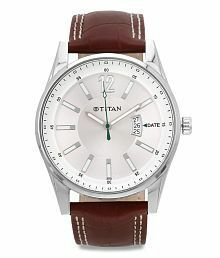 Mechanical or quartz you can pick a stylish one from a fashion brand like Tommy Hilfiger for that elegant look and feel. Automatic watches work similar to mechanical watches except that you do not hand wind the watch. It is called automatic movement because your hand movement through the day winds up the watch. The movement of the hands in automatic watches are smooth and nice just like in mechanical watches. Unlike the mechanical and automatic movements, the quartz movements use electricity from a tiny battery. Of all the three movements, quartz is the most accurate, besides changing the battery once a year there is no other maintenance required and they are affordable than mechanical and automatic ones. Buying mens watches online that will match your personality and your lifestyle can be easy if you consider when and where you would be wearing it. From sporty to sophisticate, there is a wide range available on Snapdeal to choose from. With trusted brands like Timex, Diesel, Kenneth Cole and more to pick from, the key is to decide on your budget, however, this wouldn’t be tough as Snapdeal offers branded watches for men at an affordable price. Download our online app for all shopping needs. Get exclusive online shopping deals and offers on countless number of items on Snapdeal.